Taco, taco maaaaaan. I’ve got to be a taco man – err wo-man, rather. If I’m being honest, I think Thai and Mexican may be my two favorite flavor profiles, so the idea of combining them was almost too much for my brain to process. The result was just as perfect as I could have hoped for. Oh, and if you have a nice bottle of hot sauce, that’s a nice addition as well. We used our Belizean hot sauce that we bought while there on our cruise in December. It’s-a spiceeeeh!! Thai + Mexican flavors marry together with tender steak to make one amazing taco. Season the steak with cumin and chili powder, toss to evenly coat. Add coconut oil to a large sauce pan over medium heat. Sauté the garlic for about 30 seconds, then increase the heat to medium high and add the steak. Cook, stirring occasionally, for about 4 minutes or until browned on all sides. Add the coconut milk, red curry paste and salt, and stir to combine. Cook for about 5 more minutes, until steak is cooked through and sauce has thickened. 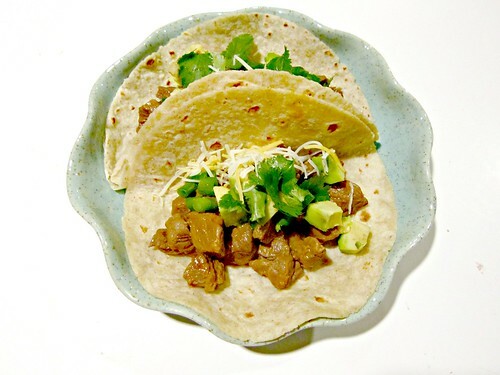 To assemble the tacos, warm your tortillas and top with Lay tortillas out, top with steak, avocado, green onion, cilantro, and shredded cheese. Use any leftover sauce from the pan to drizzle on top for some extra flavor! Oh man, ever since I saw this picture on instagram I have been waiting for this recipe. This looks ah-mazing! yay! I am happy you posted this- it sounds good!